With apologies to John Steinbeck – here are more Travels With Kathy in the UK. John Steinbeck has a wonderful legacy of wisdom in the books he wrote and Travels with Charley is one of my favorites. It is a work of non-fiction about a trip he took around America in the early 1960’s and the introduction makes me smile every time I read it. So much so that I put a copy of this book in every one of our rental homes. Anyway what he says – to paraphrase him – is that every trip, no matter how well planned and itemized, has it it’s own personality and is an entity in it’s own right – so that no matter what you think that you have meticulously scheduled – forget it and go with the flow of what is happening to you . Surrender your well made plans and enjoy what is actually the reality. 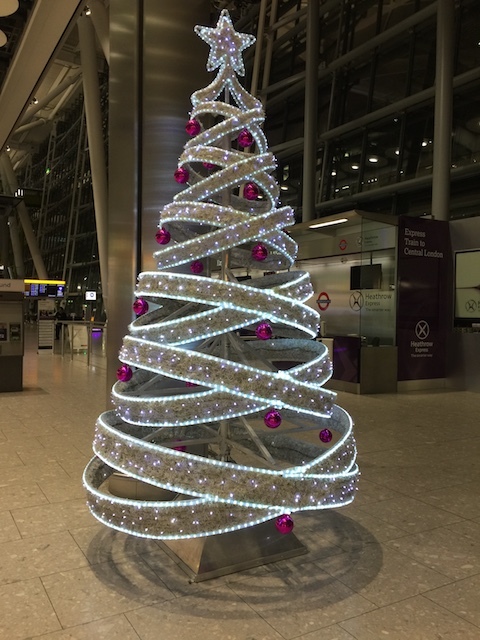 So the reality of my trip was that I really did feel very rough – the cold along with jet-lag were a strong combination and so I realized that I did need to surrender a few things and to concentrate on the solitude – which I had craved – and the joy of spending time with family and friends. As I wrote last week I had visited with our gorgeous grandchildren and Jessie their Mum, eaten with Bob’s daughter , her husband Billy and their eldest daughter Genevieve and her boyfriend James – and spent a lovely evening with Bob’s youngest son Cassius. One on one time is rare and so it was a special treat to enjoy that luxury. 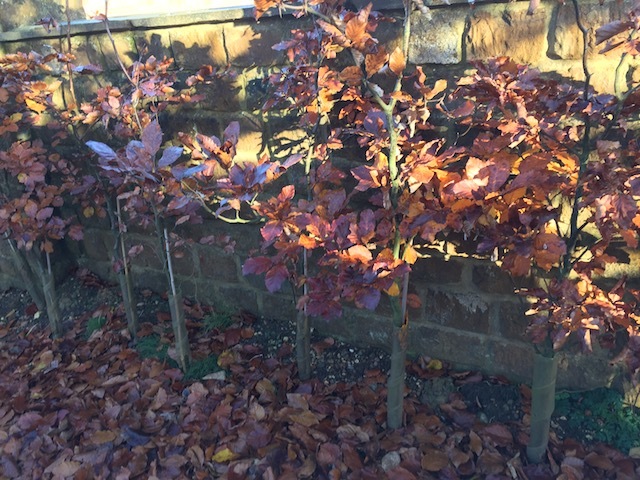 Glorious copper beech hedging where I was staying….. 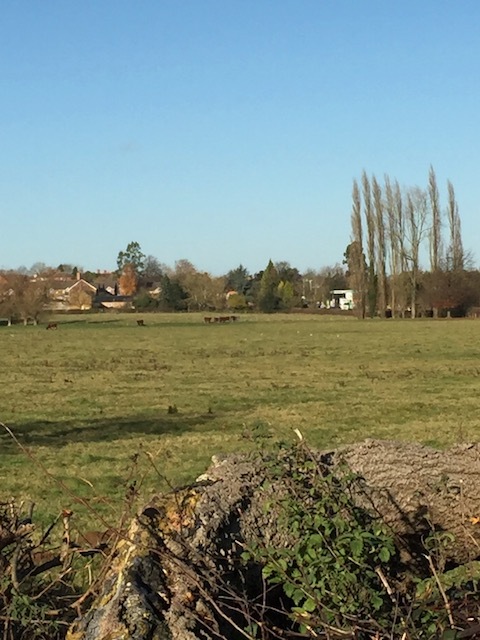 The little cottage that I had rented in Northamptonshire was a real retreat – warm and cosy and set in charming rolling countryside – plus there was an electric blanket on the bed – heavenly ! It was ideally situated for spending time with both of my sisters and seeing old friends….. Don’t you hate that expression – what I actually mean is people who have been friends for many years. Then I spent a fantastic day with friends Jo and Rick in Leicestershire together with Richard and his wife Terri – Richard was one of my stepsons in a previous relationship. Sadly his father Pete was killed in a bizarre road accident 9 years ago – but it bought us together for the first time in 22 years. It is 8 years since I last saw them and we had a day of – ” Do you remember the time when…. 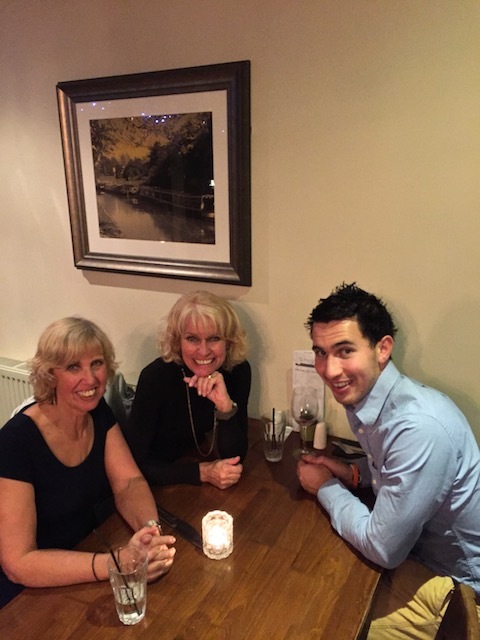 ” – We laughed a lot and enjoyed a fabulous lunch in a gastropub owned by Jo and Rick’s youngest son ! From left to right – dear friend Rick, Me ! 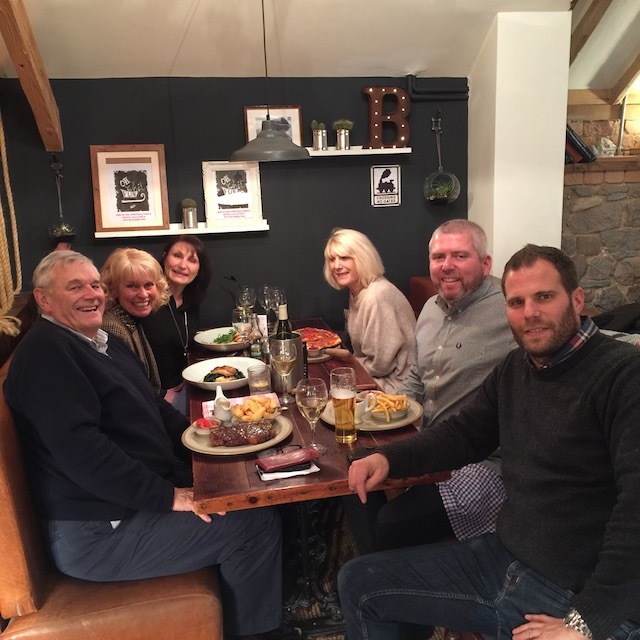 ,Richard my stepson’s lovely wife Terri, Rick’s beautiful wife Jo, Richard my stepson from a former life !, and finally Ben – Jo and Rick’s son and co-owner of the fantastic gastropub the Blue Bell Inn….. Some of the days were cloudy ,rainy and gloomy – but there were some where the sun shone and the sky was blue and England in it’s late autumn glory was heart lifting. Of course I did wear more layers of clothes than I have done in a long time – but I was warm and enjoyed the novelty of it. 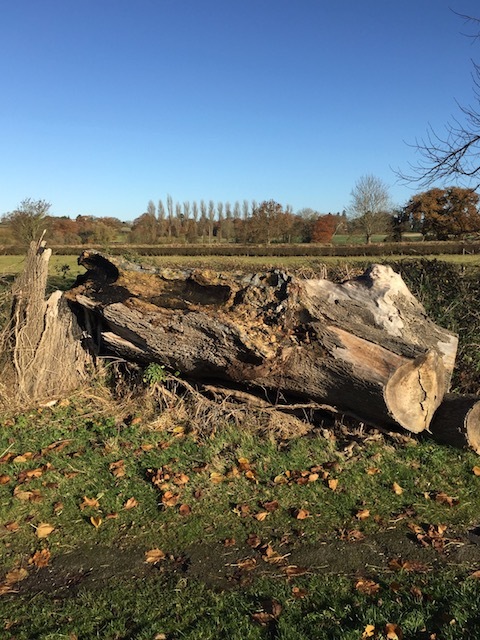 Yes well – a tree trunk ! So this trip brought me some much needed solitude – mornings were a particular delight – no rushing and no-one else to consider and breakfast whenever I wanted it. It bought me precious time with great friends and reconnection on a deep level. With true friends you pick up where you left off – no matter whether it was an age since you had last seen them. It gave me space to appreciate all that I have have now and all that I have had in the past. 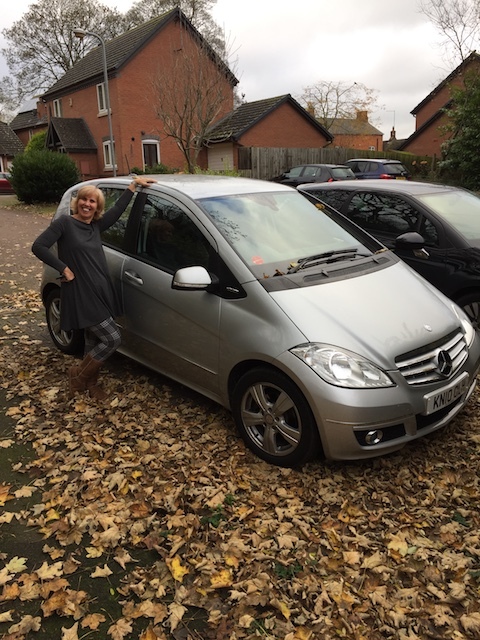 It seemed to sharpen my senses and made me truly appreciate the friendships and family that I have been blessed with…..
More Mudhita – Jane with her lovely new car ! 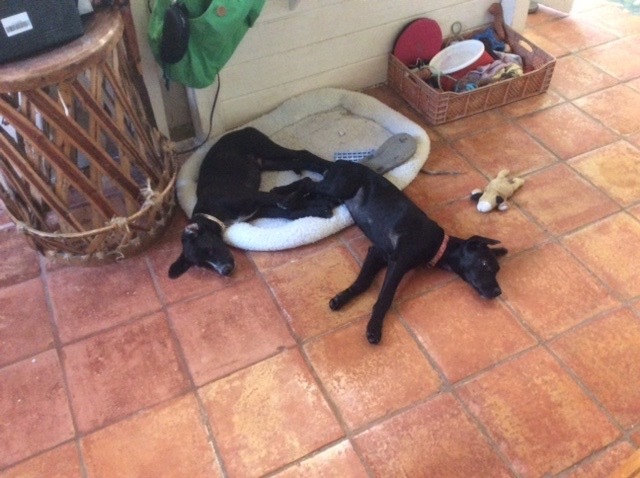 Lucky woman – and then the joy of coming back to Bob and Rudge and Eleuthera – very lucky woman……..
And finally – Rudge and Rufus – totally exhausted – but not as exhausted as Dan and Larry were by the end of my trip !!!!! Whaaaa? I STILL need a nap! Those pupsters are Trouble dan blowwith a capital T!! Thank you – looking forward to seeing you while you are here….